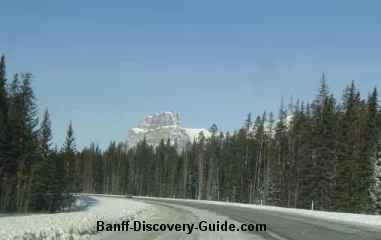 Hire a vehicle for Banff driving & sightseeing round the scenic Canadian Rockies is the best thing to do. There are so many things to see in Banff National Park that it’s sometimes difficult to know what to do first. 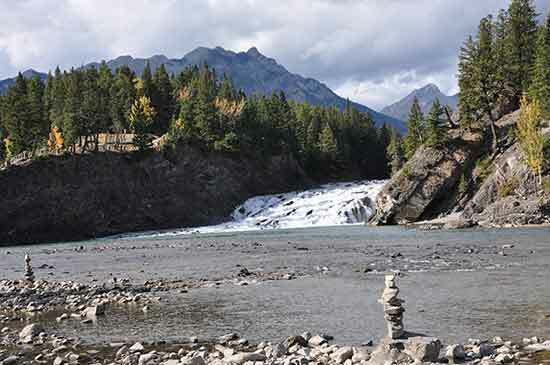 Here are some of the highlights that you should be sure not to miss during your Banff sightseeing and driving tour. There is a self-tour device called GypSy Guide you can rent to enhance your driving tour better. 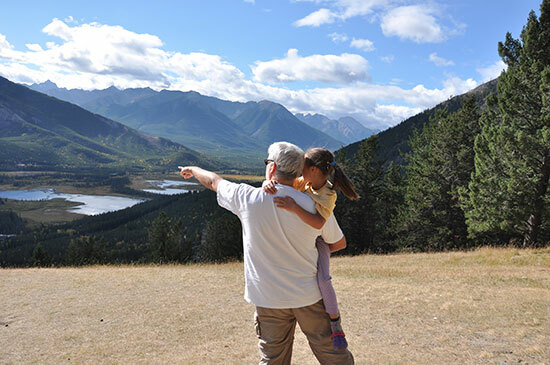 The following Banff driving itineraries is a three-days self-guided tour and provides you with time to take a few pictures and capture the sights and sounds forever in your memory. If you want to do something like serious hiking, canoe or boat cruise in Lake, you might need extra day for it. Begin your Banff driving and sightseeing trip by visiting the Banff Visitor Centre at 224 Banff Ave to pick up maps, brochures and check out what’s on this week. The followings are the stops in order. 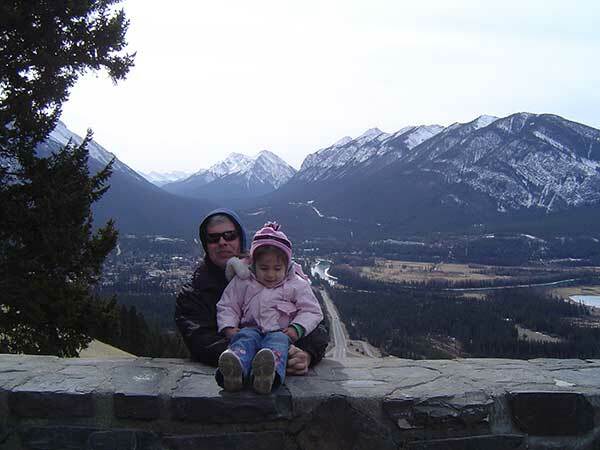 A MUST-DO in your Banff driving trip that provides you a lifetime sightseeing experience - 360 degree stunning view of rocky mountains and valleys. The best times to avoid crowds are anytime before 11:00 AM or after 5:00 PM. Also avoid weekend as you can, otherwise, you will take longer time to line-up to the Gondola. If you want to experience Banff Gondola Alpine Lights - some of the most unique evening views in the Canadian Rockies. You can go here in evening. Alpine Lights only runs only Saturdays in winter, Fridays and Saturdays from Spring to Fall. Click here for detailed. Direction: From Visitor center head south on Banff Avenue, across the Spray River bridge, turn left onto Cave Avenue after the bridge. Shortly take the right onto Mountain Avenue and follow the gondola signs until you reach the parking lots and gondola terminal at the base of Sulphur Mountain. This is the birthplace of Canada’s National Park system. It is educational and picturesque. 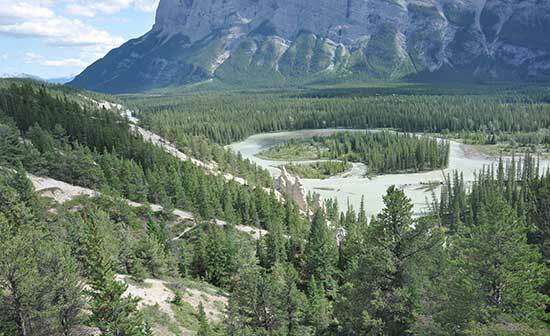 You will learn about how the hot springs had affected the growth and history of the Banff area. The Cave and Basin site itself does not take long to examine. If you are expecting lots of exciting exhibits, you will be disappointed. 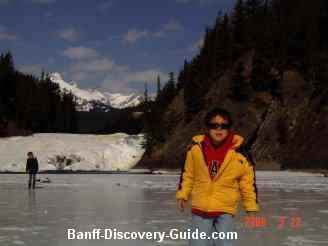 If you are looking to see how the hot springs in this place had affected growth and history of the Banff area, and enjoy seeing Nature working its magic, you will enjoy the time spent here. The Cave and Basin was embedded in a building. You will have great photograph opportunities standing on the top of the building. You will enjoy a wonderful scenic interpretive wooden trial walk just behind of the building. There is an easy paved hiking trail to Sundance Caynon behind of the building. It is 11 km return, 3 hours. You also can take a bike ride to the end of paved road, and hike another one kilometer unpaved trail to the Caynon. Direction: From Banff Gondola return back from Mountain Avenue turn right on Cave Avenue, it is at the end of the road. From Cave and Basin return back on Spray Avenue, then take a left on Bow Falls drive, you will see parking on the left soon. You may not see the falls from parking lot yet, get closer to the water and you can’t miss it. It was here at Bow Falls that Marilyn Monroe and Robert Mitchum tried to take control of their raft in the movie "A River of No Return". From Bow Falls return back on Banff Avenue, and turn right on to Buffalo Street which eventually turns into Tunnel Mountain Road at a sharp curve. Surprise Corner is here at this sharp curve. It is five minutes drive. There is no sign marking the view point. I’m not sure that Surprise Corner is an official name, possibly it was named by locals because the surprise comes from the sharp corner. 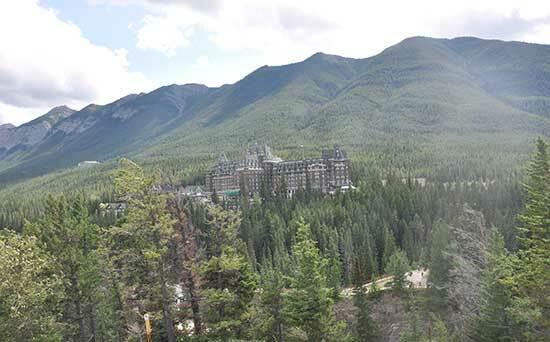 While driving on Tunnel Mountain Road towards Buffalo street, at the sharp curve you will see see the sudden appearance and incredible view of the Banff Springs Hotel. From here you can see Fairmont Banff Springs Hotel set in the middle of a green sea. Simply beautiful! If you are photography lover, this is must stop during your Banff driving trip. You will have a photo that looks like a postcard! The best time for photo lighting is in the morning. From here you also hear the sound of rushing water of Bow Falls. If you look down you will see the white waters of the Bow River flowing into Bow Falls (which is your previous stop). In addition to taking photographs of Banff Springs Hotel from the road side, there is a wooden observation deck across the road. A small parking area sits at the bend in the road just past the observation deck. From Surprise Corner continue on Tunnel Mountain Drive, and turn right on Tunnel Mountain Road, The Hoodoo viewpoint outlook will come up at right, and left will be RV campground. 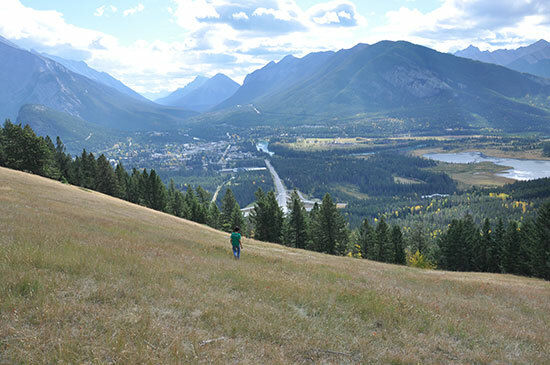 At this viewpoint you can see three vertical standing pillars of deposits that have stood for so many years, also you can enjoy spectacular views of the backside of Tunnel Mountain, the Bow River, Mount Rundle, and even the Banff Springs Hotel, which is on the other side of the valley. Continue on Tunnel Mountain Road, turn right on Banff Avenue, then continue onto Lake Minnewanka Scenic Drive, which is the easiest place for wildlife sighting. This road leads you to the Lake Minnewanka ( “Lake of the Water Spirit” in Stoney Language). 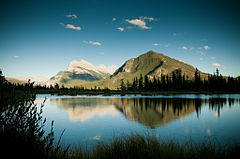 On the way to Lake Minnewanka, you will see a sign for Johnson Lake - it is only lake in Banff is warm enough to swim. You could have a lakeside picnic, or fishing there. You also will pass by Two Jack Lake, a small eye-catching jewel. Watch for Big Horn Sheep near here. Lake Minnewanka and the surrounding mountains are a popular destination for many summer activities like boating, canoeing, fishing, mountain biking, picnicking, sightseeing, wilderness camping, hiking, boat cruises and scuba diving. 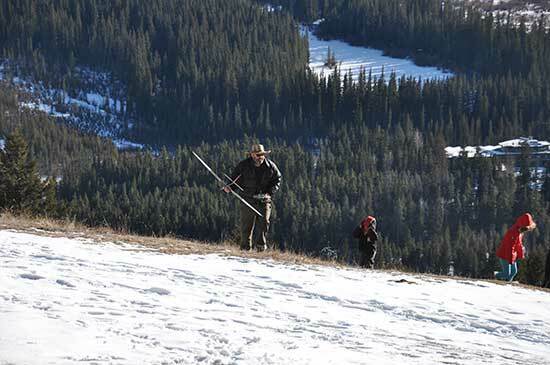 In the winter months, after the lake freezes and the snow falls, the attention of people turn to activities like cross country skiing, snowshoing and ice fishing. 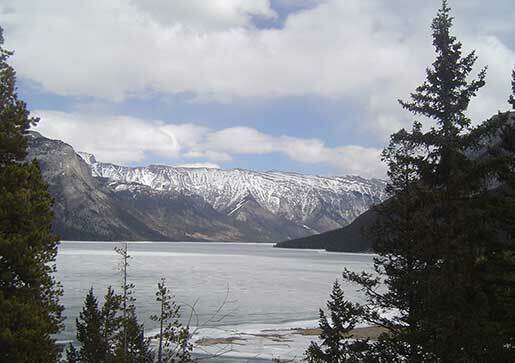 Head south on Lake Minnewanka Scenic Drive back to Trans-Canada HWY 1 West, then take Nount Norquay Scenic Drive exist. 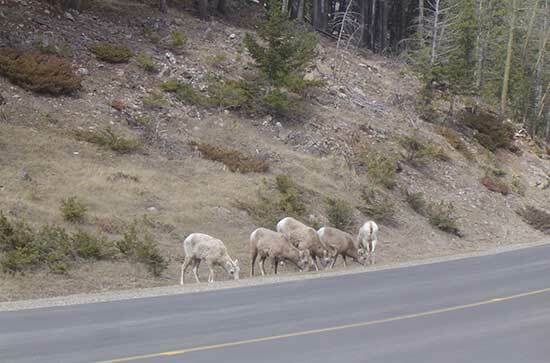 Stay on the road and drive slowly as it is winding road and there can be cyclists, and wildlife, most likely Big Horn Sheep and mule deer on it. A scenic viewpoint high up on Mt. 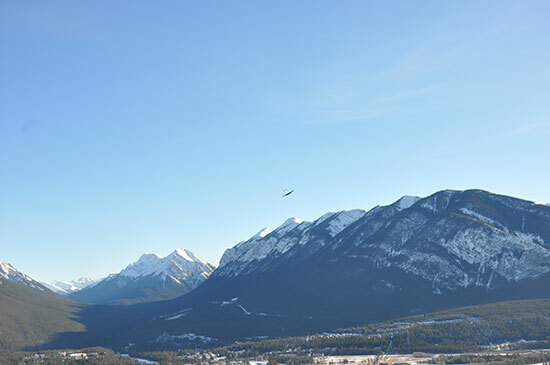 Norquay offers a bird's eye view of Banff without having to walk up a mountain to get it! 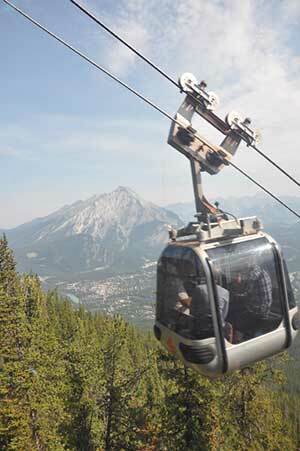 The Norquay drive will lead you up to the Norquay Ski resort where you take sightseeing chairlift in summer. On the last switchback turning curve, you will find a stone wall on your right and spaces for parking. 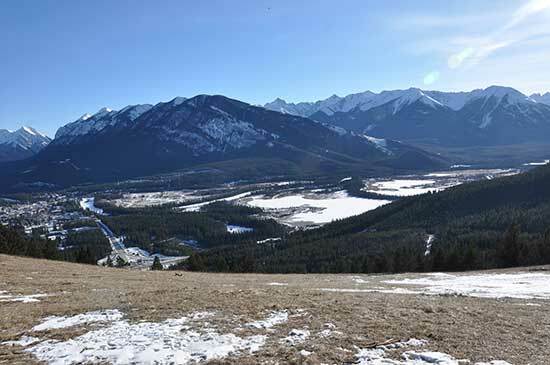 This is a scenic view point offers a bird’s eye view of town of Banff and Bow Valley, and amazing panoramic view of Vermilion Lakes, Sulphur Mountain, Mount Rundle. The grassy meadows behind the stone wall is a great place for picnic, and kite flying, etc. I saw a person playing remote controlled drone there once. Early in the morning or evenings, you might see some alpenglow in the sky if you are lucky. There are day-hiking trails to Stoney Squaw Summit (2.1 km one way) and Cascade Amphitheatre (6.6 km one way, 4-6 hours return) starting at the top end of the road - Mt. 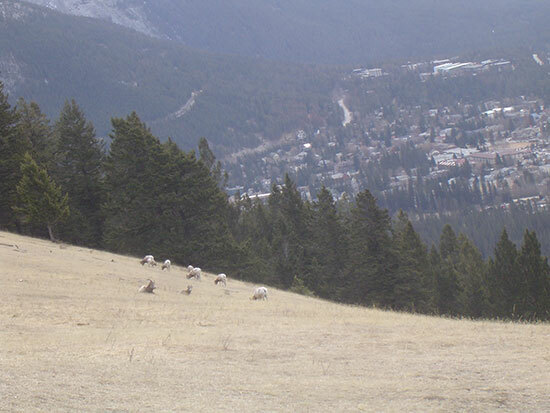 Norquay ski area if you love to hike. Driving down Norquay Drive and heading back to town of Banff. After cross Trans-Canada HWY1, turn right on Vermilion Lake road to reach Vermilion Lakes. This is a great stop for photographers and painters during Banff driving trip. The best time to catch the light is in the late afternoon or evening. When it gets closer to sunset, you can catch an unforgettable scene that the light and shadows play on the surface of the water, and color changes on Mt Rundle. 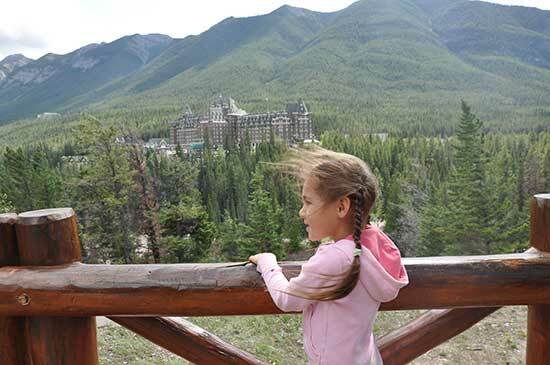 The end of the day, you might want to soak in the natural hot springs, and have a dinner in Banff Springs Hotel. You may want to go to Safeway (318 Marten St) for preparing next day’s picnic lunch.